Due to the frequent changes in fabrics, colors and availability, adjustablebedmart.com now chooses to send you direct to our manufacturer where you can order your linens and mattress pads directly from them. This cuts out the middle man and allows you to get the best factory direct pricing.We are still happy to help you through the ordering process and are available to walk you through the order page and its drop down menus. 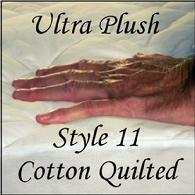 They make linens in standard sizes and any custom size you may need also. Before ordering, you will need to know the size of your bed and how thick the mattress is. All linens are available for use on conventional beds with elastic all around or they can be custom made for adjustable beds by adding the wings on the side and anchor bands on the corners. We order the wings on all of the lines we purchase for personal use but find that they stay on so well that we don't need to order the anchor bands in the corners. Want to feel and see the fabric first? Click here to order up to 4 fabric swatches at no charge to you. 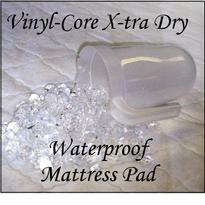 Stains will void all mattress maker's warranties so it is important to keep a quality mattress pad on your bed. 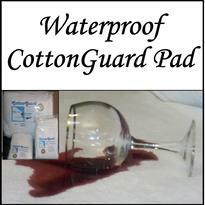 The Cotton Guard mattress protector is an ultra-thin moisture barrier. Its front side is made of 80% Cotton, 20% polyester terrycloth, and its back is a micro-thin polyurethane laminate. The Style 4 Vinyl-Core mattress pad is a heavy-duty liquid barrier, composed of two layers of soft felt surrounding a core of thick gauge vinyl. Pinsonic quilting preserves the integrity of the waterproof barrier. Its ultra-fresh antibacterial finish makes it suitable for use in health care facilities, or in home health care. 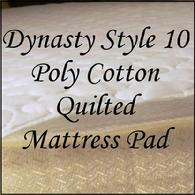 The Dynasty style 10 pad combines the durability of long-lasting poly cotton and pinsonic quilting with a sturdy 10 oz bonded polyester fill. The fitted style come with a 12" skirting to fit the most common mattress sizes.